Adjuxt oven rack to upper middle position and heat oven to 500 degrees. Brush rimmed baking sheet with 2 tablespoons oil. Cook bacon in 10 inch nonstick skillet over medium high heat until partially cooked through, about 3 minutes; transfer to paper towel lined plate. Pat shrimp dry with paper towels and toss with onion, garlic, salt, pepper and remaining 2 tablespoons oil. On linghtly floured counter, roll dough into 16 by 9 inch oveal (about ¼ inch thick) and transfer to prepared sheet. Sprinkle mozzarella over dough. 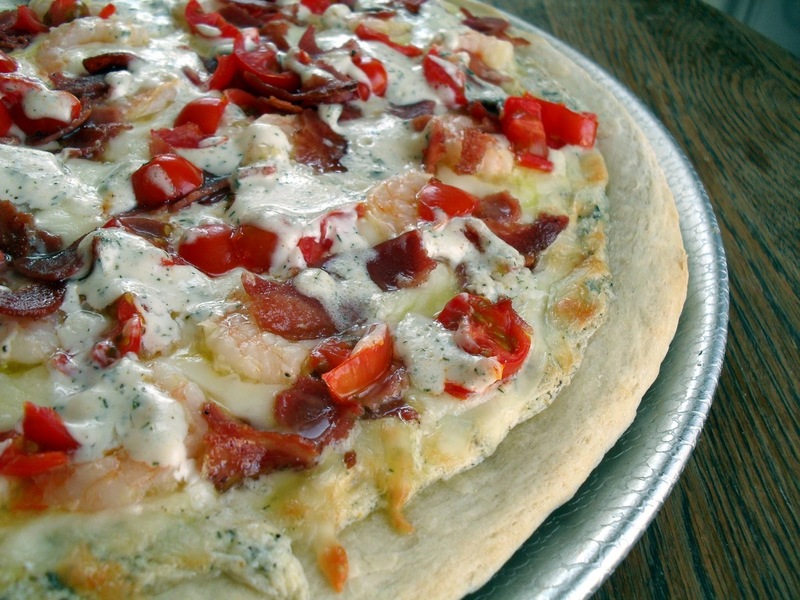 Spread shrimp mixture over cheese and top with bacon. Bake until shrimp are cooked through and crust is browned. About 13 mintues. Sprinkle with chives and let cool for 5 minutes. Serve. Note: cook the bacon only partway in the skillet or it will overcook in the oven. Dry the shrimp throughly before combining them with the other ingredients.